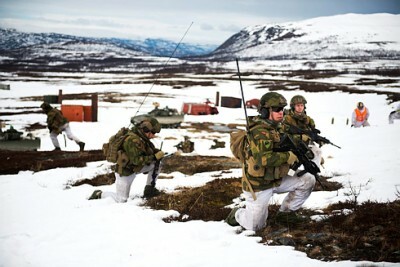 The Norwegian defense department plans to invest nearly NOK 2.5 billion rebuilding and expanding military facilities that were set up in its far northern areas during the Cold War. Many were dismantled or vacated during the 1990s, but rising tensions with Russia and between Russia and other western allies has prompted military brass to re-establish more presence in the important and strategic area. Newspaper Klassekampen reported this week that the investment will be spread around Norway’s most northern and eastern region of Finnmark, which shares borders with Finland and Russia. More than 500 soldiers will be stationed at Porsangermoen, a sprawling military camp just south of Lakselv that once was a bustling installation and is now slated for revival. Around 150 soldiers will be in place at Porsanger by the end of this month, with more to come. The defense department will invest around NOK 1.5 billion (USD 176 million) at Porsanger alone, including NOK 500 million on housing for military employees. Military activity and presence will also increase in Sør-Varanger to the east, where millions already have been spent on two new border stations and electronic surveillance of the border to Russia. Porsanger once had as many as 1,500 military personnel. The end of the Cold War prompted the state to reduce both activity and presence, since the threat from the former Soviet Union no longer existed. The build-up now will include both renovation of some facilities and razing of others, to replace them with more modern and better-suited accommodation. One of Norway’s largest airports, Banak, is also close by and due to host increased military activity as well. A new battalion will be sent to Porsanger that will number around 400 soldiers, along with a recruit facility and a school for weapons training. News of the military build-up in Finnmark comes after recent reports of frequent Russian fighter jet activity near Norwegian air space and complaints from Russian officials over the large NATO exercise Trident Juncture held in Norway last fall. Russian military exercises have also picked up recently, both at sea and on land. There have also been major spying cases, with a Norwegian man from Kirkenes still held in a Moscow jail for allegedly being a courier of cash and secret documents, while a Russian man was arrested and held in Oslo last fall on suspicions of espionage but later released. The case involving Frode Berg, a retired border inspector in Sør-Varanger, has especially troubled the local population that long has wanted to remain on friendly relations with neighbouring Russians. They never forget, either, that Soviet troops liberated Northern Norway iin 1944 from the German occupation of World War II, and then went back over the border.